“The sea level rise is bringing up water so fast that our defences against it have failed,” said Ky Quang Vinh, director of the Climate Change Coordination Office, a government agency in Vietnam’s Can Tho, the most populous city in Mekong. “Nearly half the delta population now has no access to fresh water and that’s serious,” says Le Anh Tuan, deputy director of the Research Institute for Climate Change. “Less water and sediment from the north mean more saline intrusion from the sea in the south and more losses for the delta and its inhabitants,” says La So Sinh of the Vietnamese government’s natural resources and environment monitoring agency. “In the Vietnamese part of the delta, over 150 sand mines, spread across 8,000 hectares (80 sq km) of the river’s surface, have been licensed by 13 Mekong Delta provinces,” it says. According to International Rivers (IR), an organisation working on trans-boundary rivers, China has built six “mega dams” on the river and is planning another 14 over the next 10 years. 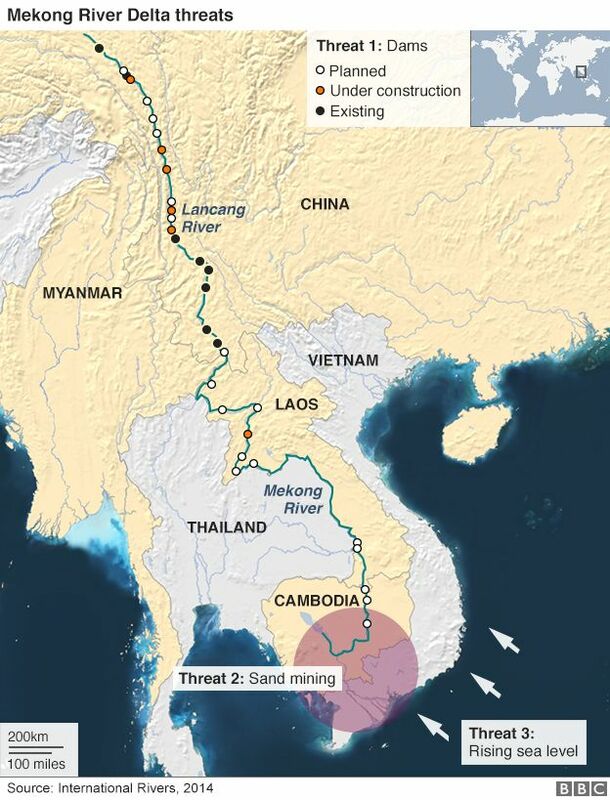 “China’s dam construction on the Upper Mekong has already had an impact downstream, especially along the Thai-Lao border where communities have suffered declining fisheries and changing water levels that are seriously affecting their livelihoods,” the IR says in one report. “It cannot ask local authorities to withdraw licenses because private companies will then demand compensation,” says Duong Van Tho from the Vietnam Mining Coalition. “Some parts of the river within our territory are just five metres (16.4 feet) deep, so big ships just can’t sail through them,” says Phan Thanh Tien, general director of the Cai Cui port in the lower Mekong. “After such dredging, big ships have started entering smaller tributaries and canals, which causes big waves of water that break our embankments and flood our homes,” says An Binh’s community leader Pham Vam Xuong. Laos, Cambodia, Thailand and Vietnam are planning to follow China’s lead by building a dozen more dams on the lower Mekong. The Don Sahong hydro dam project in Laos is especially controversial in Cambodia and Vietnam, the two countries at the basin’s southernmost tip.